Beautiful 10 piece art glass candy assortment. Don't worry about high calories for these candy! Great gift for home decoration. 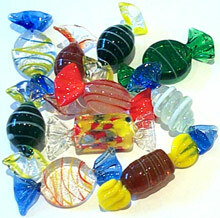 These art glass candy will look great in your favorite candy dish, or just lying around. They make great gifts for any occasions.